Russian manufacturing PMI posted a reasonably significant improvement, rising from 49.1 in September to 50.2 in October, and marking the first month since November 2014 of above 50 readings. That said, the indicator is statistically indistinguishable from 50.0 and the level of activity uplift is weak. Per Markit release, “new orders placed with manufacturing companies in Russia grew for the second successive month in October. The rate of expansion was the sharpest since November 2014, despite being modest overall. The increase in new business was driven by stronger demand from the domestic market, however, as new export orders declined. …Workforce numbers at Russian manufacturers contracted in October. However, the latest reduction in headcounts was the weakest for seven months. The sharpest drop in employee numbers was registered by consumer goods producers, according to sector data.” On a 3mo average basis, 3mo average through October stood at 49.1, somewhat better than 48.2 3mo average through July 2015, but still below 50.6 reading in 3mo through October 2014. Overall, Manufacturing reading for Russia confirms weak stabilisation in growth trend with PMIs rising for the second consecutive month. At this stage, it is too early to call recovery based on these readings, but a positive sign is that Manufacturing sector is no longer a negative factor in determining growth in the economy. Indian Manufacturing PMI posted weaker reading in October, falling to 50.7 from 51.2 in September. This is the weakest reading in the index since December 2013 (when it stood at 50.7 as well). On a 3mo average basis, 3mo average through October stood at 51.4, weaker than 52.2 3mo average through July 2015, and marginally below 51.7 reading in 3mo through October 2014. Per Markit release: “the latest PMI dataset highlighted weaker growth of both output and new orders. Encouragingly, companies added to their worforces for the first time since January and continued to increase buying levels. …the PMI has recorded above the crucial 50.0 threshold in each month since November 2013. Output growth eased in October on the back of a slower increase in new orders.” In summary, Indian manufacturing sector has avoided contraction in activity, but growth conditions have again deteriorated - with index declining for the third month in a row. 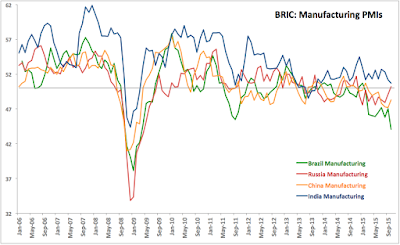 BRIC Manufacturing sector performance posted very poor figures in October, following on already poor performance in 3Q 2015. This suggests that the global economic growth slowdown remains in place despite some firming up if data coming from Europe. Amongst BRIC economies, India remains the strongest performer, with Russia now close second. 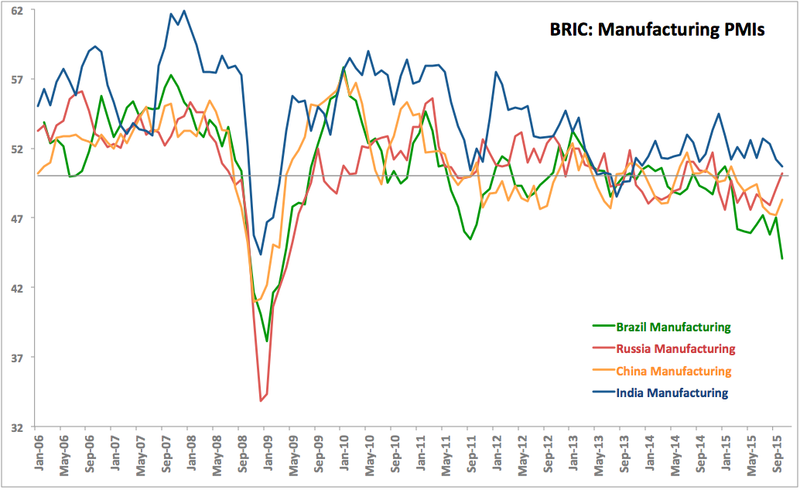 China is continuing to post weak data, while Brazil is in an outright deep sectoral recession.